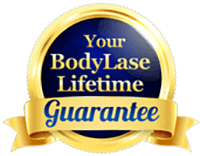 Your BodyLase® Lifetime Guarantee: Once you’ve completed your Personalized Laser Hair Removal Treatment Plan*, if additional treatments are ever necessary, we guarantee 50% off for life! Once 6 laser sessions have been completed, all future laser treatments, on the same area, are 50% off current treatment price. *BodyLase® Personalized Laser Hair Removal Treatment Plans include 6 anytime laser treatments on the same area.